Today's favorite thing is something that up until a month ago, I wouldn't have given a passing glance to, let alone believe that I could fall in love with. It all started innocently enough, when the week before Christmas I was in a pub in Charlottetown with my sister. It was one of those December nights.... briskly cold and snowy. The weather of the day had taken its toll on my hands. Skin that tends to be dry at the best of times does not take kindly to endless days of briskly cold and snow. Thus, my skin had become so dry it was painful. My sister saw me wincing and out of her purse she whipped a sample tube of GoldBond Ultimate Moisturizing lotion. I thought she was kidding and was not at all tempted by the idea of dry-hand relief. For years, I have believed that GoldBond had striven to make itself the most undesirable product on the market. 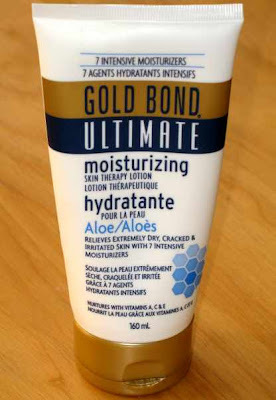 When I thought "Gold Bond" I immediately thought of grimacing, dry, itchy elderly people. Not an image that I like to dwell on, let alone imagine for myself. As I winced again and my knuckle ripped, I was persuaded to give it a try. What a miracle. Within seconds my hands felt relief. The skin was considerably softer after just one application, and after I nicked it from her purse, they were 100% better by the end of the weekend. Since that weekend I have stocked up on the lotion and have it readily available beside my bathroom and kitchen sinks, and in my own purse. My hands have never made it through a January day with such suppleness. When are you going to learn that occasionally your little sister knows a thing or two? I refuse to accept that to be true!! *Sigh* one of these days you will finally get it!